Joan is right at home at Ruah Woods Press where she can combine her passion for teaching with her love of Theology of the Body and the Church. She has been a consecrated member of the Regnum Christi Movement since 1993. She earned licentiate and doctoral degrees in moral theology at the John Paul II Institute in Rome, as well as a Bachelor of Arts degree from Thomas Aquinas College, and a Master of Arts degree from the University of Toronto. She taught theology at Mater Ecclesiae College in Rhode Island from 2006-2015, where women discerning the consecrated life in the Regnum Christi Movement earned a Bachelor of Arts degree in Religious and Pastoral Studies. 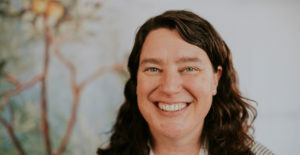 Joan is currently serving as an adjunct professor at Mount St. Mary’s Seminary and spends the balance of her time developing and hosting our educator training for ROOTED: Theology of the Body K-12 Curriculum. She can be heard on TOB20, (a series of 20 podcasts, approximately 20 minutes each) in conversation with Hannah Keegan and Keith Warnke covering essential topics of particular interest to those who want to teach and better live out the most beautiful aspects of Theology of the Body in the classroom.